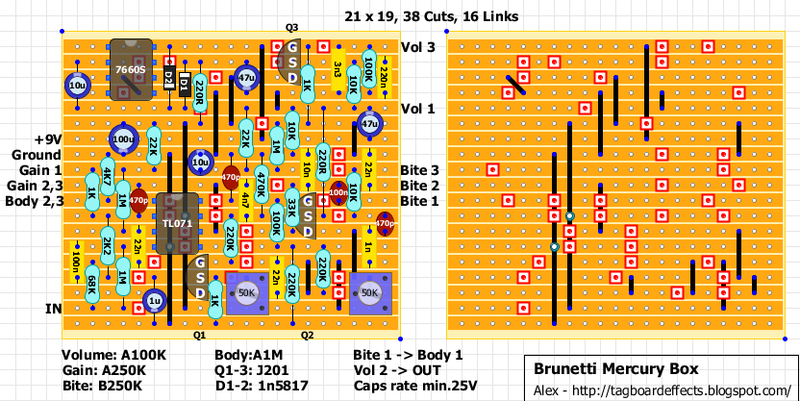 Here is a layout for the Brunetti Mercury (should fit in a 1590B size box). Frank_NH has uploaded another verified, slightly modded version in the Forum section a while back. 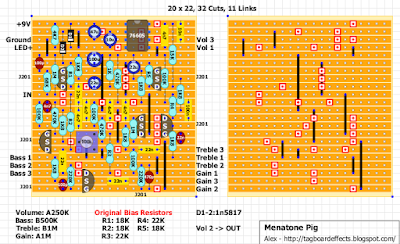 Start biasing JFETs at 9V. Here is Brian's modified version of the old Maestro FSH-1. You could buy his PCB here and find all infos about this project here. 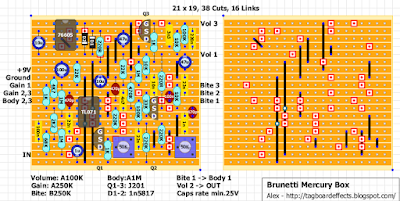 Here is a layout for John Hollis Easy Vibe. 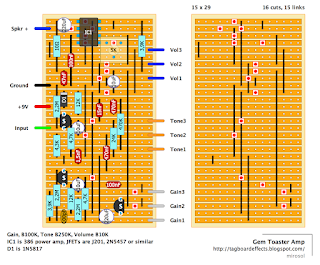 I've added Mark Hammer's anti-ticking mod and Piotr Zapart's LFO mods. Don't know if you enjoy occasional story or not, but here one goes anyway. A friend at work was visiting his parents during easter holidays. His father is quite handy building stuff and while he had joined a local combo of fiddlers. He built himself a mandolin which was truly beautiful workmanship. Being handy as he is, he built himself a preamp for the guitar pickup housed inside the instrument. Due to his limited understanding of electronics, he tried his hardest to make the preamp drive a speaker. As we all know, that won't work. Or it will, but not in a manner that's even remotely usable. His biggest issue was that this setup ate up a lot of batteries and quick. The son told me about this case and wondered what could be done to remedy the situation. He figured that i might have an answer of some sort, being the guitar enthusiast i am. I thought about it for a while and my first instinct was to recommend a small tube combo. But the goal was to have the mandolin heard, not necesserily loud, just a bit louder. And this was the best to achieve with a single 9V battery - and that battery should last as long as possible. Although being a true craftman the money became the next issue. So a 9V battery and a decent level of volume on a decent frequency range on a budget. Lucky for me, the pickup used was a standard single coil, so no ridiculous input impedance numbers as with some high grade piezos were needed. 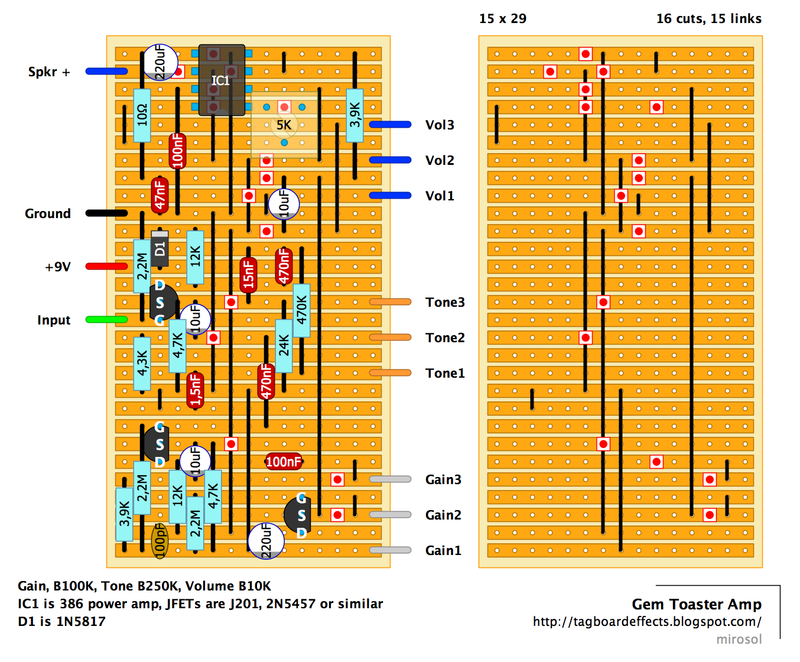 I had drawn myself a "FYA Bone Toaster" circuit some months ago. This was aiming to be a JFET based preamp that could perform as a clean boost with minimal distortion and thus, perfect for jazzy tones. With controls of level and tone (not completely unlike big muff tone stack made active), i figured this could very well work as a preamp. And followed by yet another Ruby Amp with one cap value upped to keep the low frequencies in tact. Took both schems and drew a layout up. The next thing was to draw the board so it could be mounted in a hand build combo cabinet with as little hazzle as possible. So i figured the pots should be board mounted. This sets a number of limitations to the board, but i think i managed to squeeze it in rather nicely. I've had a love/hate relationship with LM/JRC386 distortion and gain settings, so to keep this thing's gain at usable levels for a village fiddler, i used a 5K trimpot for power amp gain. This way the gain and volume pots could be maxed and then the trimmer used to tweak the best balance between low distortion and high volume. It's not possible to get both at the same time, so the trimmer comes in handy here. I printed the layout out and gave it to my friend. Helped him with ordering parts and then we wait. I wanted to try the layout myself before i send a novice on a path of becoming electronics building addict with an unverified layout (and no guarantees it'll work). Built it and was rather pleased with the results. This circuit ran into 4ohm 15" element. Whoah. A great simple reverb from Madbean. You can find his 1590G size boards and infos on his website. 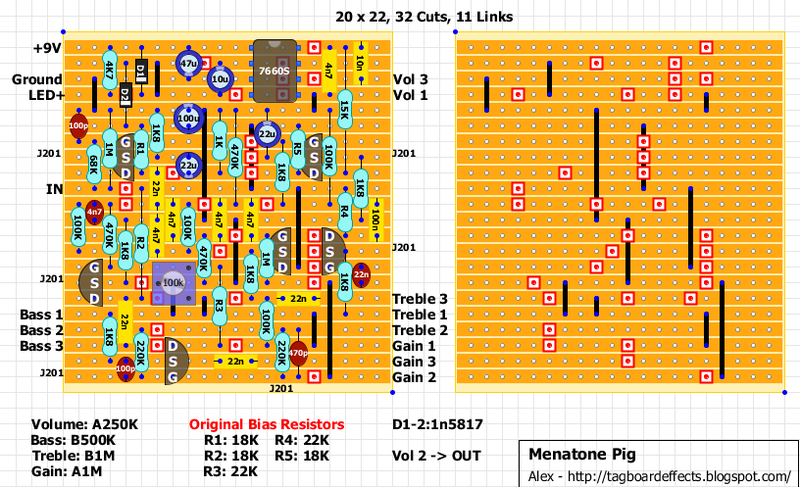 The way the layout has been drawn you should be able to solder the brick directly to the board and lay it under it.